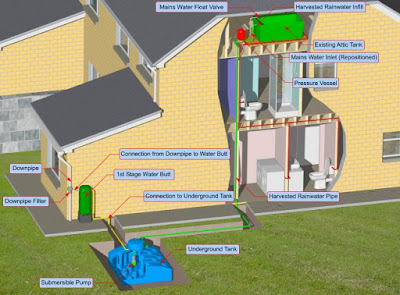 CIVILSTAGRAM: Rain Water Harvesting System. 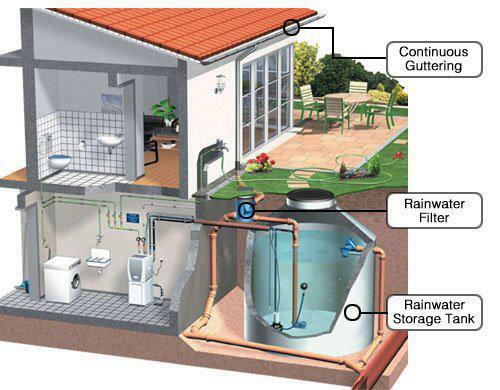 Rain Water Harvesting is an act of accumulating and storing rainwater for reuse. As we know rainwater is the purest form of water, we can utilize this water for various purposes after necessary purification process as per required. This system can be a boon in regions where there is shortage of water. This problem is common in today’s big cities. Hence rainwater harvesting can be very effective in these areas. containers above or below ground. 2. Charged into the soil for withdrawal later (groundwater recharging). 4)Reduce storm water discharges, urban flood. 6)Reduce seawater ingress in coastal areas. In this method, rooftops are used for collecting the water. If buildings with impervious roofs are already in place, the catchment area is effectively available free of charge and they provide a supply at the point of consumption. Paved and unpaved areas i.e., landscapes, open fields, parks, storm water drains, roads and pavements and other open areas can be effectively used to harvest the runoff. The main advantage in using ground as collecting surface is that water can be collected from a larger area. This is particularly advantageous in areas of lo rainfall. The potential of lakes, tanks and ponds to store rainwater is immense. The harvested rainwater can not only be used to meet water requirements of the city, it also recharges groundwater aquifers. Storm-water drains: Most of the r colonies have proper network of storm water drains. If maintained neatly, these offer a simple and cost effective means for harvesting rainwater. *Whether to store rainwater or use it for recharge? to do so, in a particular region. The sub-surface geology also plays an important role in making this decision. the total annual rainfall occurs during 3 or 4 months, are examples of places wheregroundwater recharge is usually practiced. In places like Kerala, Mizoram, Tamil Nadu and Bangalore where rain falls throughout the year barring a few dry periods, one can depend on a small sized tank for storing rainwater, since the period between two spells of rain is short. number of rainy days as that of Delhi, traditional rainwater harvesting tanks, known as tankas, are used to store rainwater even today in residential areas, temples and hotels. How much rainwater can be harvested? The total amount of water that is received in the form of rainfall over an area is called the rainwater endowment of the area. Out of this, the amount that can be effectively harvested is called the water harvesting potential.